Derive from this base class to create a custom inspector or editor for your custom object. 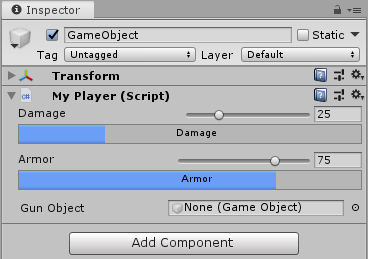 For example, use a custom editor to change the appearance of the script in the Inspector. You can either use UIElements to build your custom UI or you can use IMGUI. To create a custom inspector using UIElements, you have to override the Editor.CreateInspectorGUI on the Editor class. To create a custom inspector using IMGUI, you have to override the Editor.OnInspectorGUI on the Editor class. If you use UIElements and have Editor.CreateInspectorGUI overwritten, any existing IMGUI implementation using Editor.OnInspectorGUI on the same Editor will be ignored. The following example defines the layout of a custom inspector in uxml. The definition loads as a resource and the VisualTreeAsset.CloneTree method puts the hierarchy in a VisualElement object. The InspectorWindow will instantiate an InspectorElement containing the custom inspector. The InspectorElement will call Bind on the custom inspector binding it to the MyPlayer object. UIElements automatically updates the UI when data changes and vice-versa. To bind data and automatically update data and UI, set values for the "binding-path" attributes. Styling of the inspector is done in uss. If automatic handling of multi-object editing, undo, and Prefab overrides is not needed, the script variables can be modified directly by the editor without using the SerializedObject and SerializedProperty system, as in the IMGUI example below. CreateInspectorGUI Implement this method to make a custom UIElements inspector. DrawDefaultInspector Draws the built-in inspector. DrawHeader Redraw any inspectors that shows this editor.